Made-up words. Quesarito, Stuft, Crunchwrap, Bellgrande... Nope. If it's so complicated that it needs it own language, it's probably a calorie-fest. The boxes, the combos, and the multi-item meals. These things contain unnecessary amounts of food with little rhyme or reason: Do you really need a side of TACO with your nachos?! Create your own combo by mixing and matching the picks below. It's worth spending a few extra cents to save a lot of calories. Fresco Style. These two words are like a magic wand at the Bell. Order anything Fresco style, and you'll be trading cheese, mayo-based sauces, sour cream, and/or guacamole for fresh pico de gallo. Major calorie saver! Sauce Packets. Before you get too sad about kissing those creamy sauces goodbye, embrace the chain's 0- to 5-calorie sauce packets! The Border Sauce comes in Mild, Hot, Fire, and Salsa Verde. There's also Salsa Del Sol picante sauce. Hot stuff! Vegetarian FYI: Have you heard? Taco Bell is the first fast-food chain to have items certified by the American Vegetarian Association! Of course, not every vegetarian option is a smart choice. For your best bets, see the foods marked with a (V) below. Choose from grilled chicken, shredded chicken, grilled steak, and seasoned ground beef -- the chicken picks have the lowest fat and calorie counts. Each of these includes lettuce and pico de gallo... Yum! If you want cheese instead of pico, skip the Fresco mention (and request no sauce, if you get the steak): Then each taco will clock in at 160 - 190 calories and 5 - 9g fat. We told you the words “Fresco Style” are magical! Have two tacos for 300 calories or less. Not much of a Cool Ranch fan? 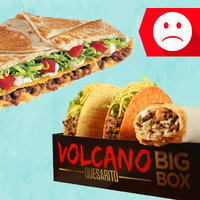 Try the Nacho Cheese or Fiery Doritos shell... Same calorie count! Here we have a smart vegetarian option with a lot of protein and fiber! If you need a handheld all-in-one meal, this is a solid pick. Get this: You don't even need to abandon the cheese here; just ditch that Avocado Ranch! That saves you 70 calories and 8g fat. Wanna slim this down even more? Go Fresco Style, and it'll have 300 calories and 7g fat. Before you complain that we took off the good stuff... You still get yummy grilled chicken, plus creamy guac, crunchy romaine, and zesty pico de gallo. SSS: Super smart side! And if you get the Black Beans & Rice, that's 180 calories and 4g fat -- also certified vegetarian. Without cheese, it'll have 140 calories and 3.5g fat; without red sauce, the cheesy beans will have 180 calories and 7g fat. No meat here... just refried beans, cheese, veggies, and red sauce. Leave off the creamy topper, and this is a safe item. 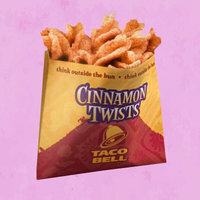 Breakfast at T. Bell is tricky -- there are so many BAD choices. 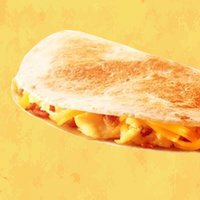 This thing's your best bet… Not too shabby for something packed with bacon, eggs, and cheese! Skip the bacon, and you're down to 170 calories and 9g fat. Forget all the other crazy desserts on the menu. These cinnamon-y sweet crisps have been our go-to forever… They're amazingly delicious and have about the same caloric impact as a single-serving bag of chips. No, they don't really have nutritional value beyond being delicious, but if you need a sweet treat, this is your best bet. Hey, tomorrow (October 24th) is FOOD DAY -- a day dedicated to inspiring Americans to eat better. Click to read up on the movement… then check out these clean-eating recipes! Click "Send to a Friend" now, because you can think of at least 5 people who need this info ASAP.